Home Healthcare: Who Comes To Work For Us? If you’re in the healthcare industry and are thinking about changing your current place of work, then maybe you should check out what kind of jobs Tendercare Home Health Service currently has available. We have to warn you though, we’re pretty selective about who we hire, because we’re looking for the right people with the heart to engage in the kind of work we do every day. Let’s take a look at why so many people are interested in working with our home healthcare agency. Tendercare has been providing the Indianapolis area with home healthcare solutions for more than two decades, and during that time we’ve drawn some of the best people in the home care services industry to us. If you have been working for an organization that wasn’t paying competitively, didn’t offer vacation, or other benefits, then Tendercare will be able to help you on all three accounts. We’re the largest family-owned home health care company in central Indiana, allowing us to offer benefits that many smaller businesses simply can’t. Providing good benefits and an excellent place to work at just two of the many reasons that we draw the best nurses in the area to us. You might already have a job in the healthcare industry, so why might you want to change to a home healthcare agency such as Tendercare? Here are some of the reasons we hear in interviews regarding why people are interested in moving to a home care agency. Relationships with Staff – The way our staff gets along and the good things they say about Tendercare certainly gets around the nursing community. It’s also well-known throughout Indianapolis as well, since we’ve been named a “Top Workplace” for the previous four years by the Indy Star. When we started Tendercare, we gathered together nurses who we knew we’d like to work with, those “who were intelligent, kind, compassionate, personable, and reliable: the type of person that [we] would want to take care of [our] own family.” Though the staff is more than 300 now, we make sure to find the right nurses who will fit the culture, a culture we’ve built on caring. Because we spend so much time on the hiring process, nurses and staff tend to stick around for a while, which only grows the interconnectedness. The Pressure – We don’t have to tell you that the healthcare industry can be a high-pressure job. And we’re not here to tell you that all of that pressure goes away when you join Tendercare. But because most nurses are spending extended time with the patients, the changes in the patients’ situations tend to have more smooth transitions that the nurses, doctors, and patients are able to see coming. The Schedules – The rough schedules that many nurses in other fields have to keep ensures that they’re always tired and never happy with how their work time is managed. Because we take care of so many patients, our home care agency has flexible scheduling that many healthcare professionals enjoy. Relationships with Patients – There’s probably nothing that draws people to home healthcare more than the kind of patients we get to work with. In many cases it’s young children who are in need of at-home care, which is certainly an aspect of the job that’s close to many nurses’ hearts. At Tendercare you’ll have the opportunity to help our pediatric patients at the beginning of their lives as well as our elderly patients who might be at the end. This page details some more of the reasons that nurses might choose to apply to our home health services agency, as well as any jobs that we might be looking at filling. Since our business is always growing, we’re nearly always looking for registered nurses (RN), licensed practical nurses (LPN), and home health aids. As of this writing we’re also looking for physical and occupational therapists. 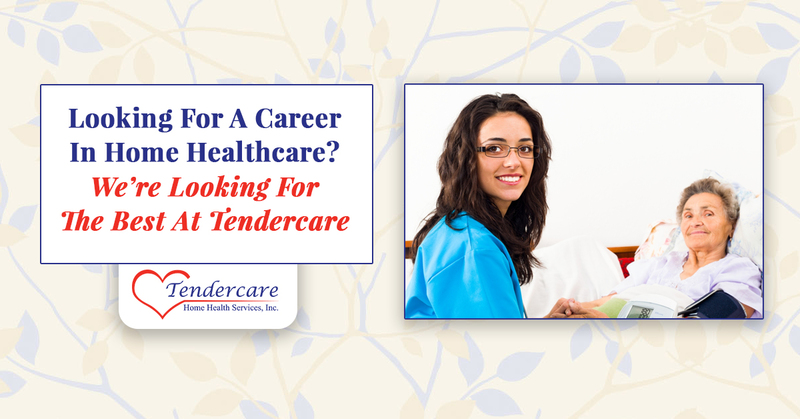 If you’re a healthcare professional looking for a change in career, maybe Tendercare Home Health Services is right for you. You’ll not only get to work with great people, but you’ll also be able to form lasting relationships with some of the patients. Click here to find a list of the jobs we’re currently accepting applications for. Good luck!